Hard to believe it has been ten whole years since Phish’s 2003 Winter Tour. February ’03 can certainly go overlooked in the Phish world, surprising considering the jam-heavy five-song sets that scattered much of the tour. It was also a month that included two absolute barn burners on the 26th in Worcester, MA (“Moma Dance”) and the home-run followup up on the 28th in Long Island, NY (“Destiny Unbound” bustout). 2/28 is still one of my go-to shows for a long car ride. Everyone talks about the “Tweezer” but don’t sleep on the “Bathtub Gin” and “Back on the Train” in the first set. 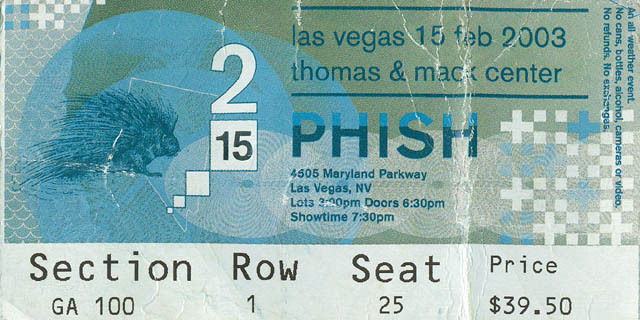 For this week’s Phish Friday we look back on this exact day, ten years ago — February 15, 2003. This was the second show of the Winter Tour and included the first “Life on Mars” since ’97 and a five-song second set of all segues which had everyone talking up the “Hood” afterward. This was also the first time “Ghost” was played in Phish 2.0. We’re lucky enough to have the full concert video available from Team Hood! Check it out and Happy Friday! It should also be noted that Mike Gordon and Dicky Betts played with Moe. later that evening. Stash teases and a 2001 tease. Notes: Reba did not have the whistling ending. Life on Mars was played for the first time since March 2, 1997 (253 shows). Antelope included Stash teases and a 2001 tease. Fans hung a large white banner over a section of the venue balcony proclaiming that it had been “871 Days Since Last Ghost”; the same banner appeared the next night indicating “1 Days Since Last Ghost.” Hood included a “silent” jam. Setlist via Phish.net & Ticket stub from John Greene.